This post was originally published on Guidestar. All those searches mean that ranking highly on Google is one of the most effective ways to grow awareness of your nonprofit and gain supporters — especially since it’s free! If your website appears high up in Google search results, more people will click on your listing and visit your website. And the more visitors your website has, the more donations, subscriptions and shares you’re likely to receive. But with millions of websites competing to be ranked on Google, it can be difficult to know how to get your website to the top spot. How can you make sure that your content is: A) seen by Google, and B) matched up accurately with relevant queries people are searching for? That’s where Search Engine Optimization (SEO) comes in. In this post, I’ll show you the three steps to starting an SEO strategy that will help you rank on Google, including examples from a successful real-life campaign. Google is designed to match each search query to the most relevant web pages, in the fastest time possible. SEO is the science (or, depending on who you ask, the art) of creating and promoting web pages in a way that makes it easy for Google (and other search engines) to match your web page to relevant queries. With some effective SEO, your web pages should appear on the first page of Google results when someone searches for a related term, and maybe even as the very first listing. So, what should you be posting in order for your organization to be seen by potential supporters? Nowadays, it’s not enough to just write some content and publish it. If it isn’t created with SEO in mind, your content is unlikely to be found by the people who are searching for it and who would benefit the most from reading it. Instead, you’ll need to think strategically about what people are searching for, and write content specifically to meet their needs. Otherwise, you will be virtually invisible to Google — and therefore to those 3.5 billion daily search queries too. This is why keyword research is vital. In the world of SEO, keywords are the words and phrases that indicate what a web page is about. Search engines use keywords to determine which pages will match with a search query and are likely to provide a relevant answer. For every piece of content you write, it’s good practice to have a specific keyword as your focus. To come up with a list of keywords you should be creating content for, you’ll need to do some keyword research around what people are searching for. Brainstorm relevant things your members or customers may be searching for. 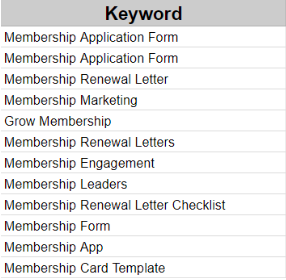 Plug all those keywords in to an SEO keyword tool to gather data. Filter down the list based on that data, to focus on your target keywords. To illustrate and expand on the points above, let’s use Wild Apricot as a real-world example. Wild Apricot is a leading Membership Management Software Platform, and as Head of Demand Generation, I’ve helped develop a SEO and keywords strategy that means thousands of people find our website every day. Before you get started researching keywords, you need to decide who your target audience is. For example, at Wild Apricot we know who uses our platform, and we know who could benefit from using our product. Simply put, our audience is anyone who is running a membership organization. If your nonprofit is a medical practitioners association, for example, your target audience is probably nurses, doctors and surgeons. 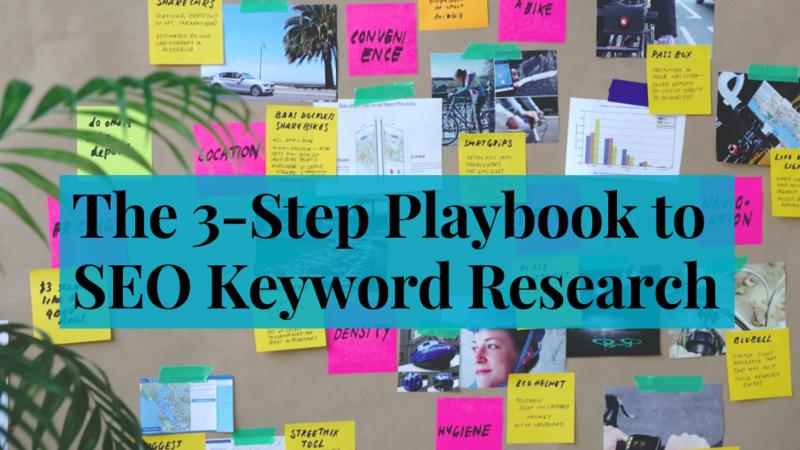 With that in mind, let’s take a look at the playbook in more detail, and show how your nonprofit can work toward ranking on Google with a SEO keyword strategy. Gather your colleagues and try to create a list of things you think your audience would be searching for. It’s safe to assume that a Membership Manager or Executive Director would be interested in one of these topics — and plus they're all semantically related, meaning that Google will find it easier to interpret what my website is all about. 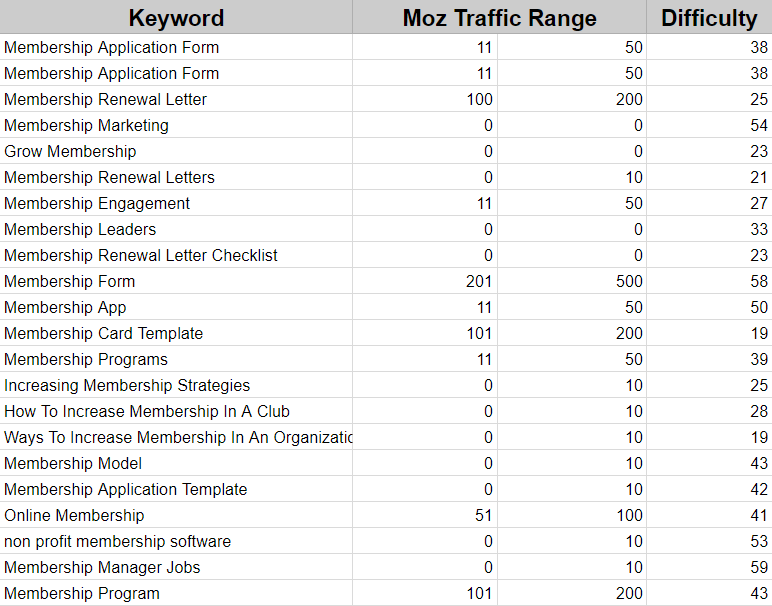 Next, let’s add some data alongside these keywords using a tool called Moz. There are lots of online tools available to help you with SEO, but one of the pioneers of the SEO industry is Moz. In particular, their Keyword Explorer tool is widely used to gather data on people’s search queries. Monthly Volume: Show how often a term or phrase is searched for on Google each month. Difficulty: A score from 0 (easy) to 100 (difficult) that estimates how difficult it is for you to rank your content on the first page of Google. Enter a keyword from your brainstorm session into the Keyword Explorer. Note down the monthly volume. Note down the difficulty score. Next, we’re going to use this data to create a shortlist. The idea here is to focus on keywords that have the highest chance of ranking on Google, and therefore having visitors click through to your site with the least amount of effort. 0 - 20: Easy! Go for it. 20 - 40: First page ranking shouldn’t be too hard. 40 - 60: More competition. This is going to take some work. 60+: Hard! You’ll need to spend months getting backlinks and promoting your article. That’s it! Now we have our first two keywords to try ranking for! All this means that if you create content that is optimized to rank on Google for these keywords, you have the highest chance of appearing high up on on Google and helping more people discover your website with the least amount of effort. Write SEO-optimized content that will rank for those keywords. Prepare your website to “convert” visitors, i.e. turn them into supporters by taking an action like signing up for a mailing list or giving a donation. If you want to learn how to take these next steps, plus lots of other SEO tips and tricks, please join my free webinar on “3 Ways to Use Google to Grow Your Membership”. My webinar is part of Wild Apricot’s Membership Growth Online Summit 2018, so you’ll also get free registration for four other expert webinar recordings when you sign up. I have just discovered this blog and it is very good. I wonder why it took me so long to find you!